I am somewhat averse to manifestos, in game design and elsewhere, but if I were to champion one manifesto for tabletop roleplaying games it might be this: No homework for players! This principle is implicit in many classic/OSR cultural traditions, but is rarely stated explicitly, even in the secondary commentary of blogs, forums, and other ephemera. But if you look, you can see the various traditions all working toward the principle of minimizing player homework. Some such traditions include aversion to complicated character creation and aversion to canonical setting material (“lore”). 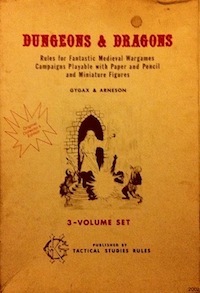 Classic/OSR play culture tends to be relatively hostile to the idea of character builds, which really took off in D&D 3E with the profusion of character option (“splat”) books. Complicated character creation takes at least two forms, which I will call character optimization (similar to the older term min-maxing) and character backstory. (Character optimization seems to capture the idea better because min-maxing focuses on the competitiveness of individual players rather than the affordances of game or play instances.) Players optimizing characters engage with rulebooks rather than socially with other players. This is good for companies that make money by selling books, but character optimization moves game engagement away from play at the table. The mantra “we explore dungeons, not characters” captures the related aversion to extensive character backstory, prioritizing the definition or discovery of characters based on events that occur in play at the table. See the following discussions for representative examples: Hack & Slash on character builds, this wishlist for oldschool games, and Noisms’ Theorem of Character Generation Length and Player Cautiousness. 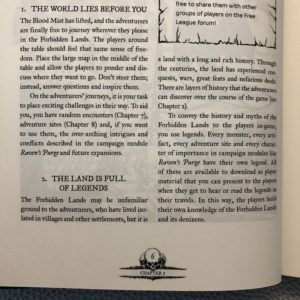 Forbidden Lands, which I have been reading recently, is one game that tries to communicate this principle directly in the text, and succeeds reasonably well, directing the referee to expose players to the setting only through play at the table: To convey the history and myths of the Forbidden Lands to the players in-game, you use legends. … In this way, the players build their own knowledge of the Forbidden Lands and its denizens (Forbidden Lands Gamemaster’s Guide, p. 6). Forbidden Lands also includes a fictional device, the Blood Mist, which functions like fog of war in a video game, obscuring both fictional geography and history: “The demonic Blood Mist that covered the lands for three centuries, draining the life out of anyone who dared to wanter too far from their village, has suddenly and inexplicably lifted. 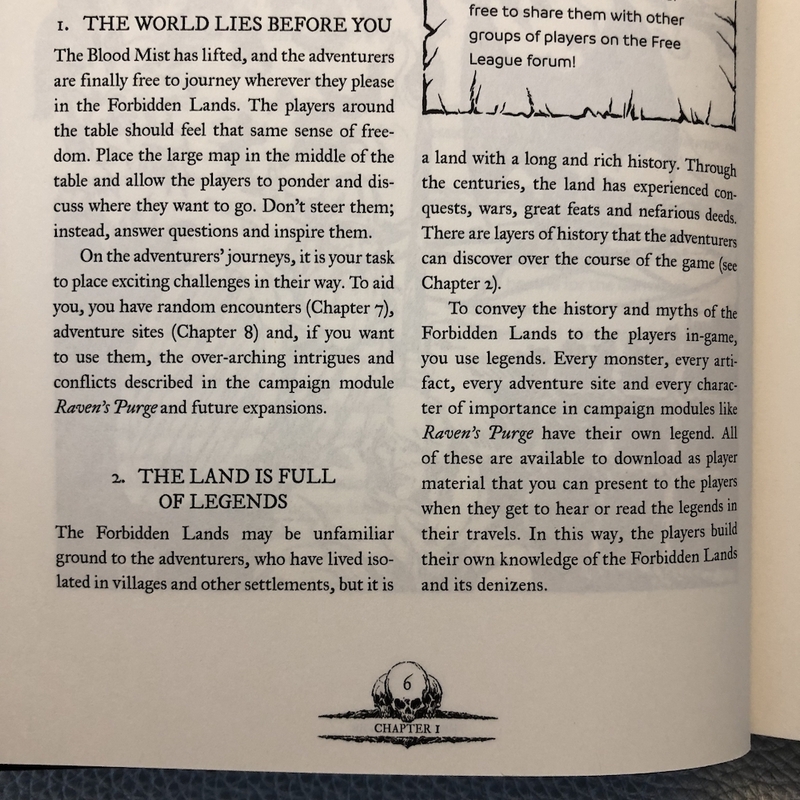 You, and other restless souls like you, are finally free to leave your homes and travel far and wide in the Forbidden Lands, looking for treasures and adventures” (Forbidden Lands Player’s Handbook, pp. 5-6). The Blood Mist works to identify the extradiegetic (player) experience with the diegetic (character) experience. What other games attempt to state this principle directly? For a player that wishes to fictionally position their full engagement, the Blood Mist justifies lack of adventurer knowledge regarding locations and other details of the fictional culture. In effect, to use a buzzword, this kind of device mitigates metagaming through setting design choices. There is precedent for using similar strategies to kick off campaigns, such as adventurers in Empire of the Petal Throne (1975) beginning as barbarians fresh off the boat. Any establishment of setting truth independent of a particular play group (canonical “lore”) comes into tension with the no homework principle, because player-accessible lore affords extradiegetic learning (homework! ), allowing players to discover the setting outside of play at the table. Homework is engagement with a campaign outside of social play. Character builds, character optimization, and studying lore are all examples of player homework. Homework means that players can hone their effectiveness, what OSR jargon calls, somewhat contentiously, player skill (see Matt Finch’s primer), by dedicating effort on their own, apart from a gaming group. For clarity, I phrase the principle imperatively, but as with most aspects of gaming (and life), there is a continuum. One could see choosing a class in OD&D as homework too, but this would miss the broader point. The more a game or campaign affords or rewards player homework, the less engagement with the game will exist in play at the table, the social interaction between players. This entry was posted in Uncategorized and tagged Forbidden Lands on January 22, 2019 by Necropraxis. However, I don’t think it’s too much to ask for players to read some minimal materials connected with a game (given how much effort a GM puts in with a campaign), as long as it’s not an encyclopedia. This is a really interesting point, and puts to words one of the things that I like a lot about low-level ACKS (and conversely, one of the problems with higher-level ACKS). I think the OSR and sandboxing does allow for and encourage mission planning outside sessions (what do we want, where are we going to go, how are we going to get there safely), but I suppose that’s often more social and also diagetic / corresponds to in-world activities. Can still be homework though.